This page's sole purpose is to provide readers with interactive charts and graphics regarding South Africa's GDP (economic growth). The page will be updated on a adhoc basis as more quarter's data is released by Statistics South Africa (Stats SA). In South Africa GDP is measured by two methods. Production method (the official GDP figure) and the expenditure method. The one measures the total value added of all goods and services produced (production method), while the other measures GDP via total spending that has taken place in the economy (expenditure method). The pie chart below shows the relative contribution of various industries to South Africa's GDP in 2018. The summary below shows the total worth of each industry as well as its overall contribution to the total economic value of South Africa for 2018. It is ranked from biggest to smallest. So from the above it is clear that the Finance, Real Estate and Business Services industry is by far the biggest industry in South Africa, with it making up almost a quarter of the country's total GDP in 2018. Worryingly the manufacturing industry is continuing its slide down from where it was many years ago, of around 20% to currently making up around 13.% of SA's total economy. See more on our ailing manufacturing industry here. South Africa's GDP for the 4th quarter came in at 1.4% quarter on quarter annualised, down from the preliminary Q3:2018 GDP that came in at 2.6%. This 2.2% has been revised upwards to 2.6%. So the 1.4% quarter on quarter is pretty strong considering its 1.4% on a stronger revised Q3:2018. Exceeding the expectations as reported yesterday in which the market was expecting around 1.1% to 1.2%. The main reason for the stronger revised Q3:2018 was agriculture which was revised upwards significantly. The numbers will not please government who is aiming for growth above 5% in order to address South Africa's persistently high unemployment rate. But it is not all doom and gloom. the 1.4% beat market expectations and is on the back of a Q3:2018 that grew faster than initially expected. So if the Q3:2018 number remained at 2.2% and wasn't revised the 1.4% for Q4:2018 would have been substantially higher. Agriculture, Transport and Storage and the Manufacturing the fastest growing sectors during Q4:2018. A pity the fast growing agricultural sector doesn't make up a larger part of South Africa's GDP, else our numbers would have been a lot stronger in recent years. Currently the agricultural sector makes up roughly 2% of South Africa's GDP. Nedbank's weekly economic commentary is predicting a 1.1% quarter on quarter growth rate for Q4:2018, which is a relatively strong pull back from the 2.2% measured on Q3:2018. According to the Buraeu of economic research, the consensus for South Africa's Q4:2018 GDP is to be 1.2% quarter on quarter annualised and seasonally adjusted. So it does look like the market is expecting a relatively low GDP growth number coming out for the end of 2018. And the data for Q2: 2018 has been revised upwards, and the initially reported -0.7% is now sitting at -0.4% showing the South African economy contracted a little less than initially thought. While this is some good news the growth numbers are a far cry away from the economic growth numbers required to address South Africa's unemployment and inequality. And while there are BRICS meetings under way, South Africa's fellow BRICS member India reported economic growth of 7.2% and this was a disappointing number for the country. Yet South Africans are celebrating a 2.2% GDP growth rate. We are so far behind the rest of the world in terms of economic growth, and we are losing our economic standing in the world stage more every year. A few years ago South Africa was around the 20th biggest economy in the world. Now its in the mid 30's. Slipping further and further down the list. In today's update we take a look at the GDP results released by Statistics South Africa today. The graphic below shows the quarter on quarter annualised growth rates of the South African economy per industry for Q1: 2018 and Q2:2018 as published today. Note Q1: 2018 figures have been revised from the preliminary estimates published the previous quarter. Worryingly for South Africans is the fact that South Africa's Q1:2018 GDP growth that was initially reported as -2.2% is now calculated at -2.6%, basically saying the economy contracted even more during the first three months of 2018 than initially thought. South Africa's economy is now in a technically in a recession, which is measured by two consecutive quarters of negative GDP growth. Continued political and policy uncertainty certainly not doing the South African economy any favours. The graphic below shows the latest GDP data as published by Statistics South Africa per sector in the SA economy. And again it is the agricultural sector that grew by a far greater pace than any of the other sectors quarter over quarter annualised. Even though agriculture only makes up around 2.5% of South Africa's economy, it contributed 0.8% of the 3.1% economic growth experienced by the South African economy for the 4th quarter of 2017. Actual GDP growth for Q3:2017 was revised upwards from 2% to 2.3% and the latest results for Q4:2017 shows a further improvement in South Africa's economic growth. While the growth rates are improving its not even close to enough to make a dent in South Africa's massive unemployment problem. The increasing taxes, the higher VAT rate announced in the 2018 Budget is sure to halt some of the momentum gained by the South African economy in recent quarters. And the talk and discussions regarding expropriation of land without compensation is bound to chase foreign investors away, or keep them from investing substantial amounts of money into South Africa until they have clarity regarding the policy by the ANC (and pushed for by the marxist EFF). This will further stunt growth in a economy that is desperate for fresh and new investment so the economy can grow at a faster rate and build some momentum which will spur on further growth and investment. Every time it looks like the SA economy is gathering some speed and momentum, politicians do their level best to slow it down, Its as if they dont want people to prosper. Encouraging to see in the graphic above is that one of the biggest sectors in the SA economy, the finance, real estate and business services industry showed quarter on quarter growth of 2.5%. Lets hope the momentum in this sector continues as it will be a big driver of economic growth in SA going forward. As has been the trend in South Africa's GDP of late, the Agricultural sector is the major contributor to South Africa's economic growth at this time, with seasonally adjusted constant prices annualised growth in Agriculture sitting at 44.2% for the third quarter of 2017. This is largely due to agriculture coming off a very low base, thanks to the drought experienced in South Africa in 2015/2016. The drought lead to massive declines in outputs from agriculture, and now increased production in the sector due to significant rains in agricultural areas of South Africa is leading to output levels being far higher than the preceding years and giving rise to the significant growth rates of the sector in South Africa's GDP. While the sector has shown significant growth in recent quarters it is still a very small sector in the overall economy. In 2012 agriculture made up 2.34% of South Africa's GDP (when looking at industry value at 2010 constant prices). For Q3:2017, Agriculture made up 2.43% of South Africa's GDP. So while looking at the graphics below for 2017 and seeing the substantial growth experienced in the agricultural sector, its overall contribution to South Africa's GDP has remained fairly similar to the levels of say 2012. Infact the numbers below shows the agricultural sectors contribution to South Africa's GDP over the last 5 years as well as the latest quarter of 2017. The interactive graphic below shows the GDP per quarter per industry. 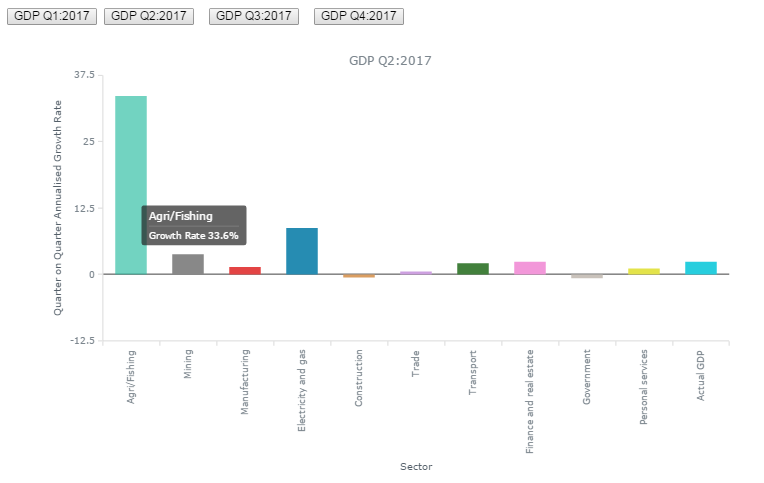 As users select one of the buttons in the graphic to choose a relevant quarter, the graphic will show the different growth rates of the different sectors of the economy for that quarter. Note the data is annualised. Essentially annualised data basically says if growth from the one quarter to the next were to remain the same for the next three quarter's the years growth would be as shown by the annualised growth rates. The graphic below provides an overview of South Africa's economic growth per sector per quarter for every quarter of 2016. As mentioned in the review of the graphic on 2017, Agriculture has shown strong growth in 2017 coming off a low base caused by the drought in South Africa during 2016. The above graphic for 2016 clearly shows the decline in growth in agriculture during 2016. Mining also had a mixed year in 2016 with 2 positive quarters of growth and two negative quarters. The variability of both agriculture and the mining sectors is part of the reason we suggested that South Africa's economy should become less dependent on driving economic growth, as a lot of what affects these sectors are beyond human or government policy control. Lack of rain leading to agricultural declines cannot be prevented totally by government or policy setting, in the same way excess rain affecting coal mining cannot be stopped completely by plans and policies. Mother nature has a mind of her own and this cannot be changed, but the impact can be limited of proper plans and policies are in place and implemented properly. However there will always be this element of variability in these sectors. The secondary and tertiary sectors are set to be more stable and easier for government to influence, steer and grow. And this is where we feel greater focus should be placed on by government. However government finds this hard to do as a large amount of their supports are employed in the agriculture and mining sectors. This any move by government that is seen as neglecting or shifting away from these industries would cost them votes at the polls (and this is obviously something they would want to avoid). And hence South Africa's continued dependence on primary industries to drive and grow SA's economy as well as trying to provide more jobs, even though these industries are shedding massive amounts of jobs. While the above looked at the quarter on quarter annualised growth rates, the graphic below takes a look at the year on year growth rates measured each quarter. And the story it tells about South Africa's economic growth rate is rather depressing, especially considering the fact that government initially had a growth target of 6% per year (now after Minister Gigaba's #MTBS2017 it seems even that pie in the sky growth target has been revised downwards to 5.4%). So in an ideal world, South Africa needs to grow at 5.4% per year in order to significantly reduce unemployment in South Africa. Take a look at the numbers below. We are not growing at anything near that pace. This section will focus on GDP calculated from the expenditure side, and in particular on Household expenditure as this contributes roughly 70% of total spending in the economy. The bar chart below shows total household spending in South Africa on various categories. Total household spending for quarter 2:2017 (March to June 2017) amounted to just under R669billion (putting annual spending by South African households close to R2.7trillion a year. The bulk of consumer spending as shown above is spent on Food and non-alcoholic beverages, with housing and transport making up the 2nd and 3rd biggest spending categories of household spending in South Africa.